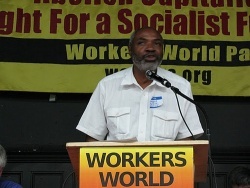 8 "Eyewitness Report from Aleppo"
Abayomi Azikiwe is a Detroit organizer of the Workers World Party and editor of the Pan-African Newswire. The Workers World Party instigated National Conference to Reclaim Our Cities was held Friday, November 11 thru Sunday, November 13 in Detroit in the Wayne State University Student Center Ballroom. People from the throughout the state of Michigan and delegations from New Orleans, Cleveland, Baltimore, New York and other cities will converge on the Wayne State University campus to develop strategies for the rebuilding of urban areas around the country. Under the theme: "Money to Rebuild New Orleans and all U.S. Cities, Not for War," this national meeting of grassroots, labor and peace activists will call for the feeding of the cities and the starving of the Pentagon. Demanding funds for jobs, housing, Social Security, schools, healthcare and the environment, the conference will focus on the Bush administration's budget which slashed 150 domestic programs while it pushes the spending for war to over half a trillion dollars a year. Organizers of the event say that it is time to launch a struggle to win the right to healthcare, quality education, decent housing, food, utilities, and jobs at living wages. A partial list of endorsers for this event includes: Maryann Mahaffey, President of the Detroit City Council, JoAnn Watson, member of the Detroit City Council, Donald Boggs, President of the Metro-Detroit AFL-CIO, Nathan Head, President of the Metro-Detroit Coalition of Black Trade Unionists, Ed Rowe, Pastor of Central United Methodist Church, Marian Kramer, Co-President of the National Welfare Rights Organization, the Gray Panthers of Metro-Detroit and Workers World Party members David Sole, President of UAW Local 2334and Abayomi Azikiwe, Editor of the Pan-African News Wire. All day Saturday, November 12, there will be plenary sessions and workshops to discuss solutions to the urban crises across the United States and the role of the increasing militarization of both domestic and foreign policy of the national government. This conference was open to the general public and was sponsored by the WSU student chapter of the the Workers World Party front Michigan Emergency Committee Against War & Injustice. In 2007/08 2007-08 Abayomi Azikiwe was Chairman of the Board of the Michigan Coalition for Human Rights. Program Schedule for National Conference of Workers World Party: 50 Years in the Struggle for Revolution and Socialism. Opening Plenary Session: The Global Capitalist Crisis, the Coming Class Struggle, the Obama Administration and the Fight for a Socialist Future. From June 14-17 2009, the Moratorium NOW!-initiated People's Summit was held at Grand Circus Park, Detroit, MI. A "tent city" was built at the location, and protesters camped there for four days of "Active Resistance, Political Discussion and Strategizing for a “People's Stimulus Plans” and an “Economic Bill of Rights” for Working People and the Poor." Moratorium NOW! is a Workers World Party-front organization. Speaking at the summit were Jesse Jackson; JoAnn Watson; Abayomi Azikiwe, Workers World Party; Mike Martinez, FIST, Workers World Party; Baldemar Velasquez, FLOC; Ignacio Meneses, U.S./Cuba Labor Exchange; and Rosendo Delgado, Latinos Unidos. As at Feb. 10, 2011, Abayomi Azikiwe had endorsed State Senator Hansen Clarke's Senate Bill 1306, "which would stop all mortgage foreclosures and evictions for two years." The bill is being supported by the Workers World Party-front, Moratorium NOW!. On September 21, 2010, Abayomi Azikiwe attended a meeting at a midtown hotel with President of Iran, Mahmoud Ahmadinejad, and approximately 130 members of the U.S. "peace and social justice movements", as well as "major figures in the Black activist community." Abayomi Azikiwe Pan African News Wire, Michigan Emergency Committee Against War and Injustice, Moratorium NOW! Joe Iosbaker- Committee to Stop FBI Repression, Freedom Road Socialist Organization/FightBack! This page was last modified on 4 February 2017, at 02:46.